There’s not much of the Saratoga experience left when non-stop rain ruins the picnicking and the racing is hit hard by scratches. The epitome of a let-down occurred when Sunday’s featured $150,000 stakes went forth with only three horses. But with 28 horses taken out and 61 left in, Monday’s card was prolonged agony. Turf racing was cancelled. The program was top-heavy with New York-bred claimers. Catchapenny K.’s running style wasn’t as well suited to the sloppy conditions as Bernie’s Pal’s. But the New York-bred daughter of Pollard’s Vision made it into the field for the first race on Monday from the Main Track Only list when authorities proclaimed the turf course unusable. She finished second. Trainer Linda Rice was determined to race Bernie’s Pal regardless of conditions. The three-year-old filly is endowed with a fast-break mentality and that’s what is called for in a 5-1/2 furlong sprint, no matter the surface. In the second race, 1A and 11 were last to load in a field of four betting interests. The two horses – Black Pen and Sea of Liquidity – provided comic relief to what seemed like an over-stated crowd by holding the race up considerably. Six handlers, pushing from the rear end and pulling from the front end of Black Pen, eventually managed to get him in line with a blindfold. Sea of Liquidity went in easier, but also not quickly. Yes, you guessed it. They ran one-two the whole way around and finished the same way they started. Two minor stakes saved the track from total embarrassment. The 6-furlong $70,000 Union Avenue attracted nine fillies and mares that were foaled in the state. The slightly briefer Bennington Stakes, for a similar purse, went for three-year-old fillies born anywhere. Meese Rocks, trained by Eddie Barker and ridden by Jorge Chavez, won the former. Hilda’s Passion, an MTO entrant owned by Starlight Partners, won the latter. With the temps topping out at 64 degrees, soup was a good choice for lunch. Ada Whaley of Fishkill, NY became the first person this summer to find clams in the clam chowder. 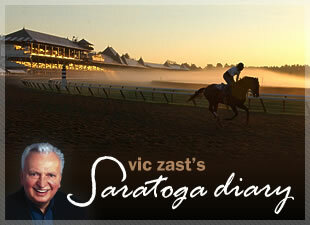 Vic Zast has attended at least one day of racing at Saratoga for 47 straight years. He is the former president of Delaware North’s racetracks, including Finger Lakes and Turfway Park.